If you have a business of any kind of services or product which is way too popular then you use various tools & scripts to make your efforts easy. For email purposes, you use some email service providers. For collecting payments, you use some online forms. Apart from all of this, a research has shown that nowadays, people are more likely to involve in discussion forums. So if you have this functionality on your website then you have a plus point. People at your forum will question & answer various queries & share their thoughts on your product. So for this thing, you can use some forum PHP scripts tools. Through them, you will be able to create a discussion board on your website & then, people can discuss their queries over there! Even if you don’t have a business & just a normal person who’s interested in creating a community of question & answers, then you can use those scripts too. Also, I’ve mentioned some of the best forum PHP scripts on which you can take a look. All of them are way too affordable & easy to use even by a non-techie guy. Even their consists a service in this article which allows featuring ads on the forum’s homepage. So you can also earn a secondary income from there! From now on, I’d advise you to read out this article & finalize the best PHP forum script tool according to your needs! The phpForum is an effective platform developed with the help of MySQL & PHP. This script functionality will allow the users to comment on your forum without any hindrance. As an administrator, you will be able to access the admin panel for managing categories, comments, UI, replies & many more elements. It gives you the freedom of selecting any kind of avatar you want to. If you have an attractive one, more people will engage on your forum website. Regular Plan: This plan costs around $6 which you can distribute to other people without any charge. Extended Plan: For the Extended plan, you have to pay $26. You can sell & then create multiple copies of your single end product. 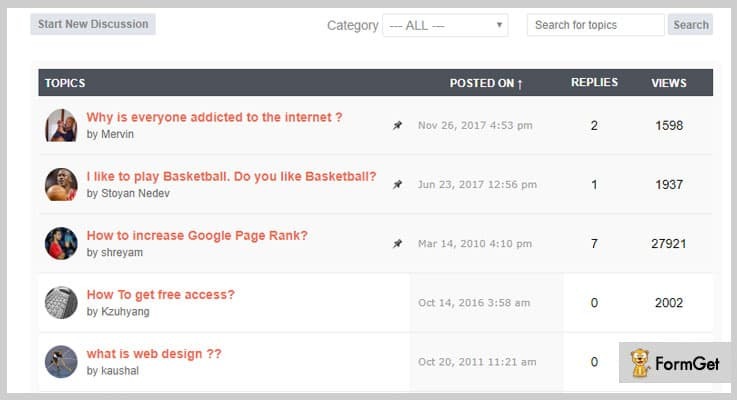 You can create limitless categories & insert the posts, comments & replies into it. So in the future, it will be easy for you to differentiate between various user’s activities. Apart from a simple login, users will also be able to log in through various social profiles. For example Facebook, Twitter, Yahoo, LinkedIn & so on. This is called ‘FLEXIBILITY’. At the bottom of the forum page, there contains a ‘Statistic’ panel. Through it, you can track some details like forum visits, total threads & online members. If you want to stay in touch with a group of people, then you may also opt for Simple Forum. 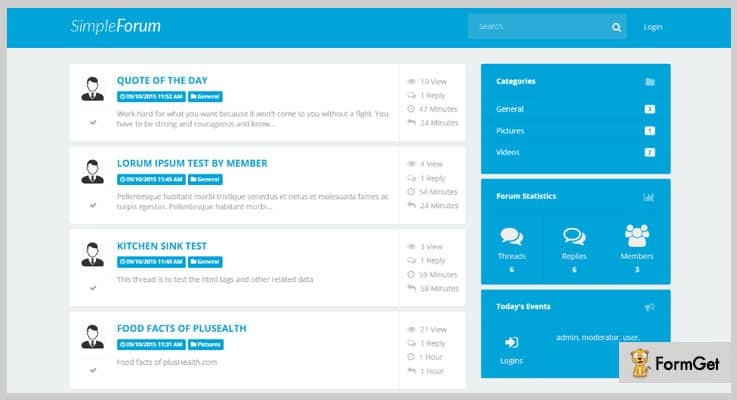 It is a responsive community & bulletin board forum software which can power your website to a great extent. Well, it comes with three kinds of modes, public (open for everyone), private (only for selected users) & maintenance (forum not available currently). So you can set any mode for a group depending upon its confidentiality & users. Regular License: This license charges $24 for the single product. If you distribute it to other people then they won’t have to pay any charge to you. Extended License: The Extended license costs around $265 for a single user. You can charge other users if you want to give them the access of this license. It has more than 8 color styles for grooming all of the pages & making them look attractive & colorful. It is widely used because of only one thing: ‘The more a thing looks beautiful, more it will be used!’. Apart from your forum work, if you want to earn a secondary income then you can enlist advertisements on your interface. It comes with 4 ads spaces & you can put distinctive promotions on them. On each discussion, you can separately see the stats of a number of views, replies, upvotes & downvotes done by the users. 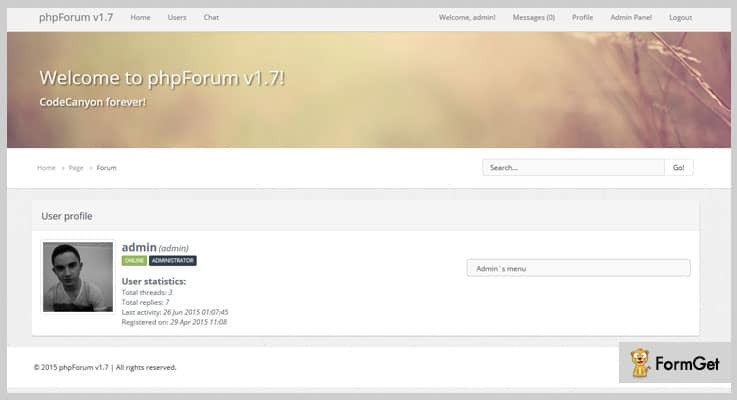 PHP Forum Script is an online forum software through which you can add the discussion board functionality to your website. It is 100% customizable for any kind of forum needs. So you can design its interface according to your needs. As an administrator, you can choose more than 5 types of themes to make your discussion board look unique. They will surely help in engaging more & more users to your platform. User License: This plan charges $35 for features like custom modifications, limitless installations, free updates & so on. Developer License: You will get some features like source code manipulation, copyright removal, installation support, etc at just $59. As an admin, you will be able to approve the comments & replies of the users. If you find it informatory & non-disturbing, then you can allow it to be displayed on the wall. You can enable or disable the voting functionality for each of the comment & reply for any specific group. For account confirmation, forgotten password requests & comment approval, you can set the autoresponder emails according to your needs. A smart system is what people say about it. 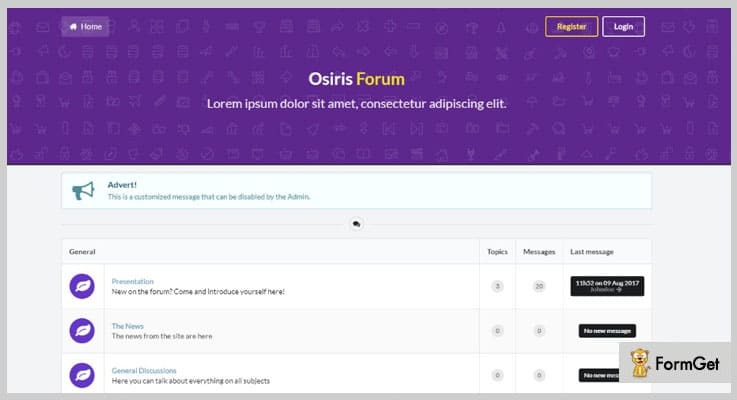 Osiris is another forum script supporting PHP language. 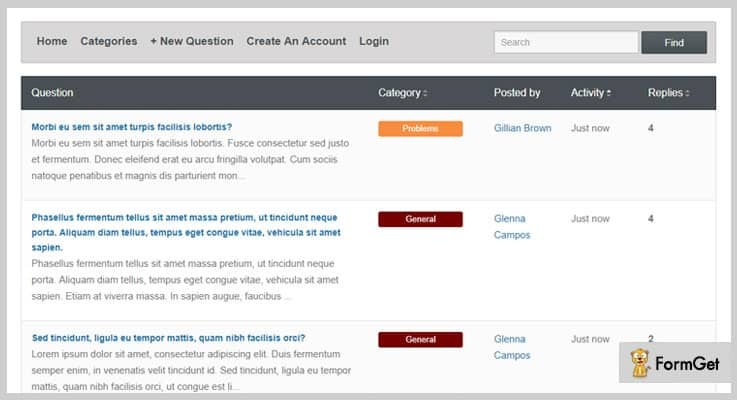 It is also based on semantic UI library system for better categorization of forum topics. This tool allows configuring various elements like forum title, description, color, avatar, signature & many more. Well, it has a GIF file running continuously on the background which is a major reason for attraction nowadays. Basic Plan: This plan bills around $37 with future updates, free support & no transaction fees. Extended Plan: It charges $111 for features like multiple message templates, connections management, topics categorization & so on. The users in your forum can make announcements & can especially highlight them in the topmost section of the forum group. Even the users can also add their signatures & highlight their own posts in a better way. So it will get a higher visitor count. As an admin, you will be able to see which user is online at the current time. So, you can track his/her activities in a much better way. As you can understand by its name itself, Simple Forum PHP Script is way too easy to use & implement on any kind of website. Even a guy who has no technical knowledge can also use it without any hindrance. If you think that your forum will only be restricted to one language than it is not fair. This script has a feature of various languages support. So you don’t have to worry about it. It has a single plan of $29.99 charge. You will get to use some features like RSS feeds, configurable source code, password protection & so on. It has CSS files which are quite easy to customize. So if you have even a little bit programming knowledge then you can transform the styling of your forum within a min. Whenever a new topic or reply is posted, you will receive the email notifications about them. This is how you will always be up-to-date about your forum activities. While submitting a comment on a topic, the users have to enter the verification code displayed in the picture. If they enter correctly, it means that a real user submits, not a robot. So above are some of the best forum PHP scripts which you can integrate with your website. That’s how you will be able to start your own discussion forum on it. They consist of various features such as autoresponder, user’s statistics, custom CSS, category management & so on. Even there is one script mentioned in this article which allows adding advertisements on their wall. That’s how you can also earn a secondary income while managing a simple forum. You will get more features once you start using any one of them. So all I’d advise you to finalize the best PHP forum script from this article & start your own discussion board on your website! For any queries, please drop a comment below & we’ll get back to you soon!